This entry was posted in 2012 and tagged 2012, rob, victoria. Bookmark the permalink. Thanks Tûtie! We are excited to be back! Where is Victoria going?? 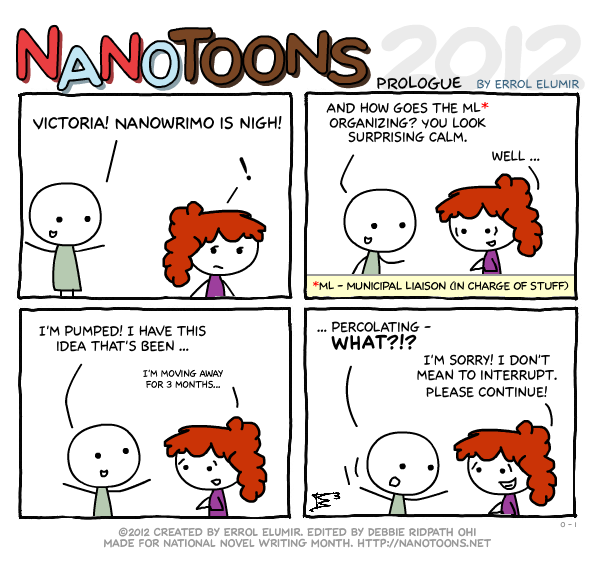 D: But in other news, I love these comics and can’t wait for NaNoWriMo! Thanks so much for having a prologue. I have loved reading the NaNoToons for a few years now and so happy to see it start! No problem! I’m glad you enjoy them! I always feel the need there has to be something that ties the two years together.